Yesterday I added a post to Cyberloom, and I realized that it is three years since the last post was added to this blog! All I can say is time flies when you are preoccupied! Today, I have been reviewing some of my 190+ earlier posts. The reason for this review is that my friend Suzanne asked me to send her the link to this blog. Gosh, I thought how to guide someone through a blog about a peculiar hobby visiting the Metaverse? Well, Suzanne, I hope that this post will help. I began writing this blog in 2008 when I was an Adult Education student looking into online education for my Certificate in Advanced Studies. 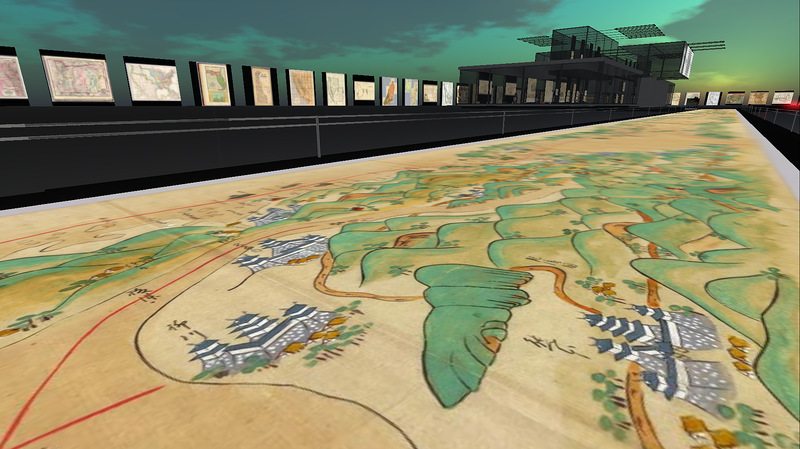 One of the first things that hooked me into the virtual world was the discovery that I could interact with it. 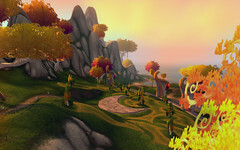 In an early post, I wrote about this in a piece titled: Living in a Painting: Introducing Second Life and Windlight. I had discovered I could take photographs and adjust the lighting in a virtual 3D space reached by my computer. Strange that this machine of glass and metal and tiny computer chips could open up such a vast and visually imaginative realm. 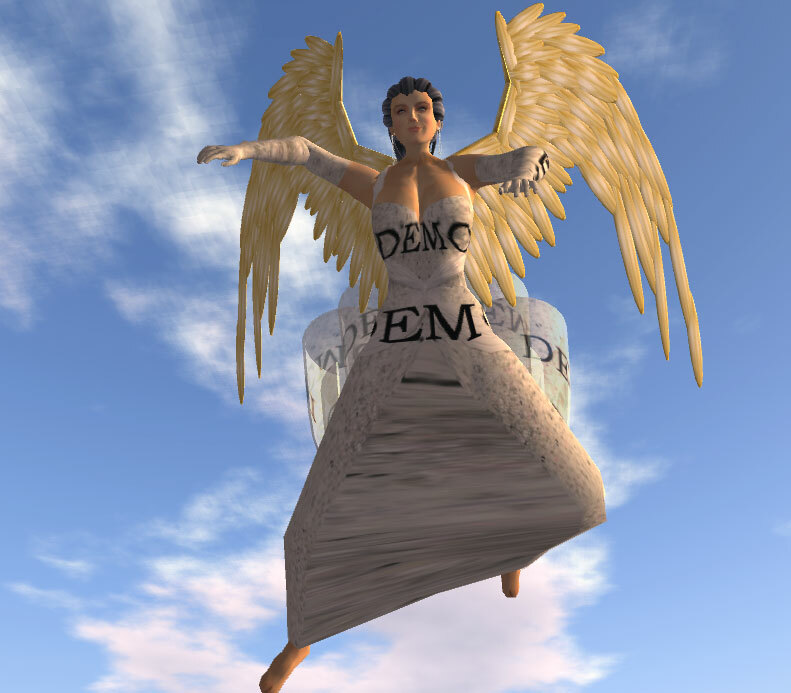 Second Life – Why would you go there? #1: To look at books! ‘Second Life – Why would you go there? #2: To be creative and express myself! 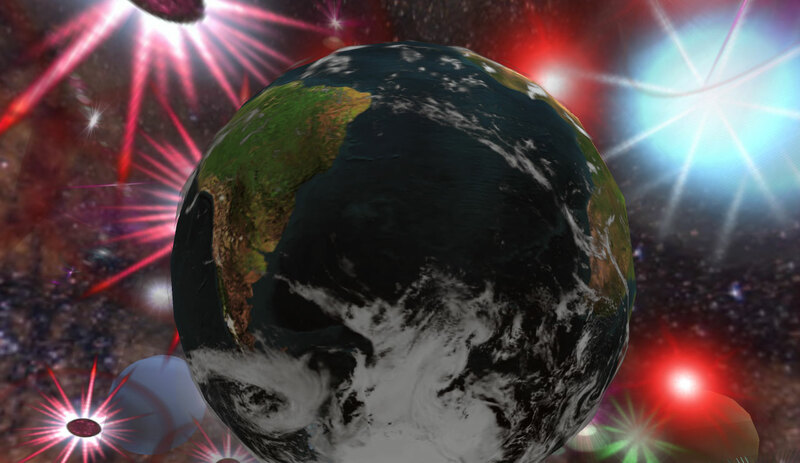 Q: Second Life, why go there? A: To practice Tai Chi in Narnia! It would be fair to say that some of us are wondering whether the White Witch has vacated Narnia and moved into the North East of the US? At least, our endless winter was temporarily interrupted by a frugal Christmas Day. Narnia, under the spell of the White Witch, may never have Christmas, but it does have clean sparkling snow (unlike the grubby gray stuff by the side of the road in real life). 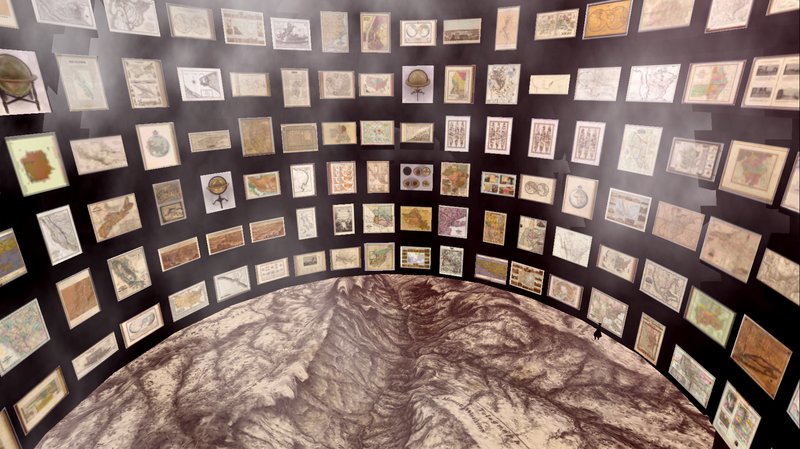 I went to visit the Chronicles of Narnia, as re-created by TP Fizzle in Second Life, to escape last week’s bad news about the groundhog seeing its own shadow on Groundhog Day. Another six weeks of winter? Where is the Turkish Delight? 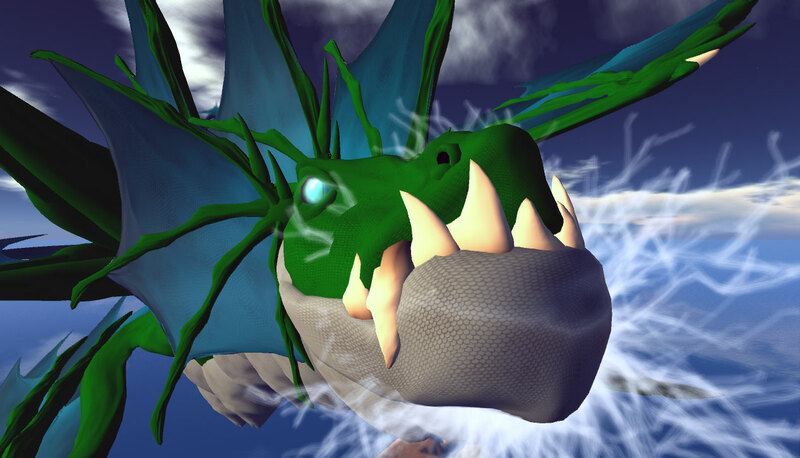 It seems wise to apply virtual lip balm, scarf and mittens to your avatar before stepping through the wardrobe. The snowy scenes awaiting you will have you turning up the central heating at home. That said, the views you will see are beautiful as TP Fizzle has an excellent eye for synthetic scenery! The photographs below show mainly Fizzle’s Narnian landscapes (because they impressed me so much). To enter Narnia: find your way into Second Life, then teleport over to the Chronicles of Narnia, if you want to sit inside Tumnus’s cave or have tea in the beaver dam. Moonlight over Narnia, is that an incubi or a sprite in the distance? Thanks to the Not Possible IRL Group for providing the landmarks to The Chronicles of Narnia. Librarians will inherit the world! I am writing this post in my college library and that seems very appropriate as I want to share my theory that librarians will inherit the earth. Why you ask? Because they know how to manage information; they know how to store and label it, and even more amazingly find where they put it! (I speak of these skills in a hushed and awed tone.) The ability to manage information is becoming an ever higher art form as we move deeper into the surging tide of words, numbers, and pictures. And another thought, as I sit amongst the book stacks, is that much of academia is floundering through an identity crisis. The golden crown has slipped awkwardly over the eyes of the emperors of knowledge. Academics are falling behind the curve as they struggle to maintain traditional learning environments where matters move at a controlled, slow pace. Take a look at Fleep’s Deep Thoughts where she describes waiting for the peer review process and publication of her paper to take place. My university is struggling under financial burdens (like most universities nowadays) but here things have been made more complicated due to the building of a huge new dorm, and a giant commuter’s car park. Both buildings represent the old world of higher education. That is, dorms and car parks are not necessary when students are opting to save fuel and environmental costs by working online. I am not saying that online education is better, not yet anyway, as it is going through its own identity crisis/teething problems. Many educators don’t dare to be imaginative online, but then, were they imaginative in the classroom either? Educational management systems, like BlackBoard, and to a lesser extent Moodle, are restrictive mediums making you feel as though you are teaching, and learning, wearing horse blinkers. Today we need to know how to access relevant information quickly, while simultaneously applying critical thinking skills to determine the legitimacy, and relevance of the information once it is located. We also want to be able to return easily when we need it. 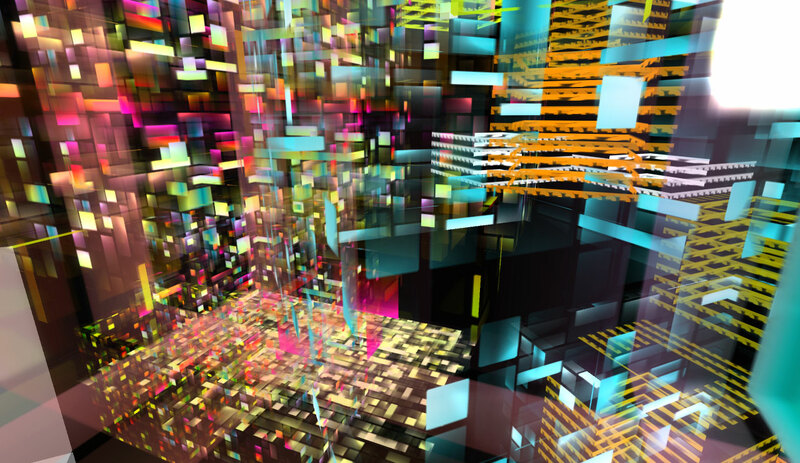 Everyday we hear of new software designed to help us manage our masses of digital data. But, the trouble with all these data storage systems is that they deteriorate in efficiency after a certain amount of data has been entered. Its not the software’s problem, it is a human problem. When things drop from view (as they do when archived) they drop from being vivid and alive in our active memory. I think that we cannot cope with more than 5 items of information before us. Why five? I chose that number because I have five fingers on one hand. My brain can manage 5 ideas, or pieces of data, without great effort. We can then expand upon each item with new sub-items and perhaps comfortably manage 10 of these sub-items (all our fingers). When we move to 20 (i.e. bringing in toe digits) we start to slip in efficiency of thought! (Our toes are below eye level, wrapped in shoes much of the time.) Nature’s portable abacus is efficient in its simplicity after all. If I was a flower I would go by the number of my petals, if I was a spider I would use my legs. Don’t take this too seriously though! The point is that we cannot manage reams of facts, ideas and data efficiently that’s all! With computers we access everything through a flat screen. In a way this computer screen is like the slit of a letter box attached to a vast library that has a museum, sports stadium and shopping mall attached. Everything is seen through this tiny narrow window and we move the information around remotely, as though it was attached to an old typewriter’s silver golf ball. We don’t move, we spin the world around before us. This makes information management trickier as everything must always be accessed from this one narrow perspective… Well, that was until the 3D virtual world popped up on the other side of the window! Now, we have the potential to arrange all our information spatially as well as logically. 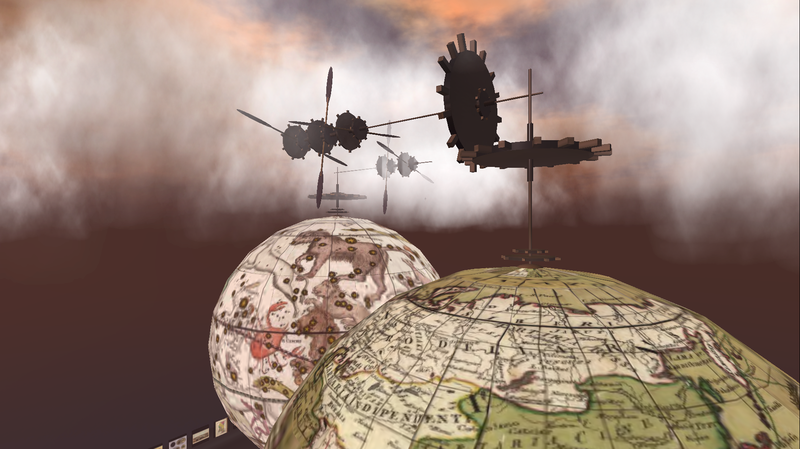 The buzz for cyberspace travelers, interested in virtual worlds, is the idea of virtual desktops. We will one day be part of a huge peer networking system where we can travel to each others desktop worlds for virtual meetings etc. I wonder though, when this information management revolution takes place, will we be so short sighted and stick to the desktop metaphor? 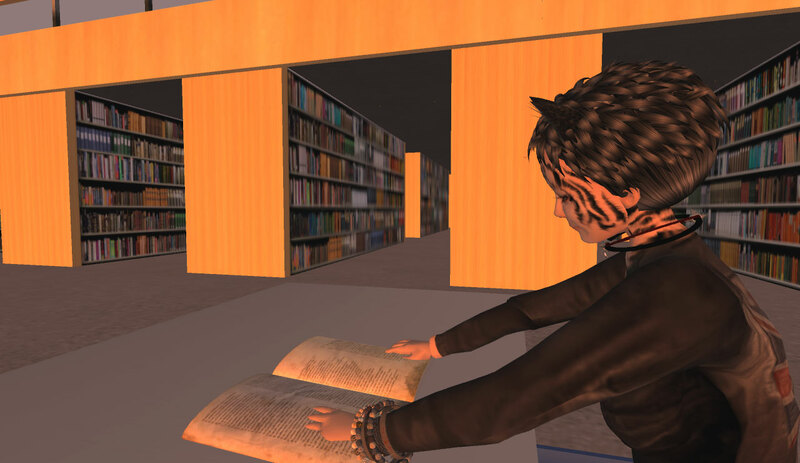 I plan to have my very own virtual library. Forget the front door step give me the universe! The Librarian daemon looks like a pleasant, fiftyish, silver-haired, bearded man with bright blue eyes, wearing a V-neck sweater over a work shirt, with a coarsely woven, tweedy-looking wool tie. The tie is loosened, the sleeves pushed up. Even though he’s just a piece of software, he has reason to be cheerful; he can move through the nearly infinite stacks of information in the Library with the agility of a spider dancing across a vast web of cross-references. The Librarian is the only piece of CIC software that costs even more than Earth; the only thing he can’t do is think. Sorry all links have to be put at the end of the post not with the pictures because this WordPress.com design is having a problem! This is one of those far-fetched imaginative places where we can all play with ideas alongside the likes of Einstein. 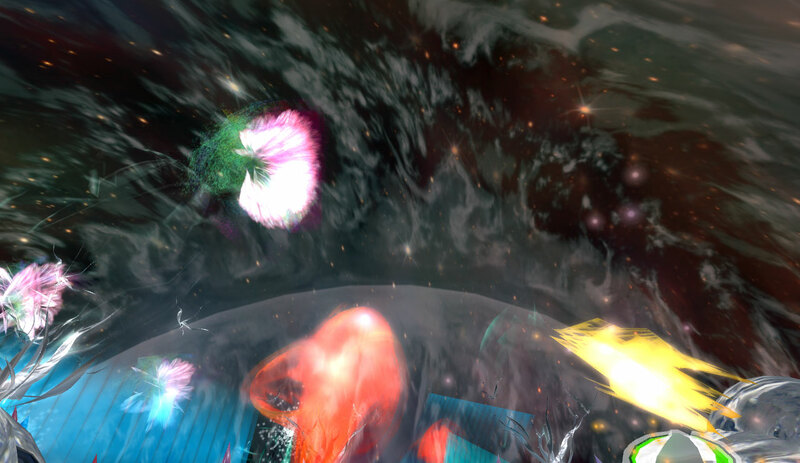 Multiverses, with their realms of space and time have something in common with dinosaurs. That is, we don’t know what color dinosaurs were, or how they sounded, or what they did everyday. This lack of information allows imagination to be unleashed yet contained within what is known. A happy paddling pool where what is imagined can also be considered possible. It is intriguing to contemplate how creative minds influence each other. Creative writers inspire mathematicians, philosophers and cosmologists inspire composers and artists etc (there is no order or sequence to who inspires who of course). All dip into abstract thought and return with new ideas. 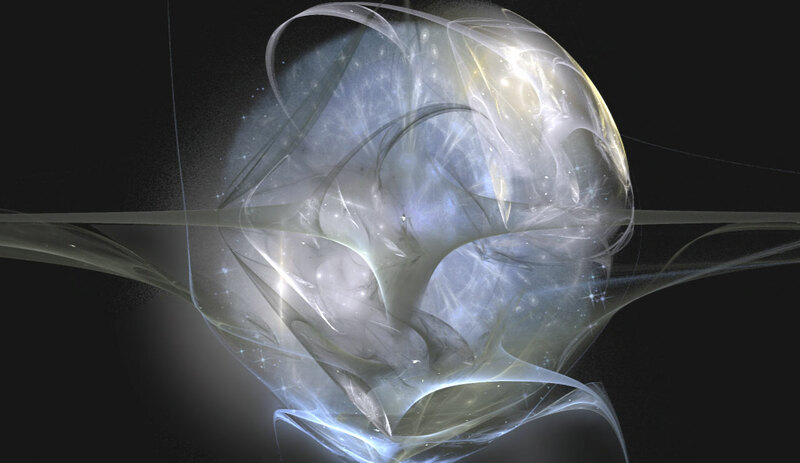 Tegmark suggests the ‘universe is really nothing more than a mathematical object’. And ‘Every mathematical object is in a sense its own universe’. You will not be surprised to learn that I had a few problems with mathematics at school. I was put into a special class with three others who were also ‘bad’ at maths. This class was taught by our Latin master who had a big, black, bushy beard that held samples of his meals all day long, cornflakes, grains of rice, odd sticky substances etc. One day our food strewn teacher said he was leaving to become a missionary in Africa (where there was apparently a shortage of Latin teachers or was he going to farm his beard?) I have wondered, once or twice, whether we were responsible for his turning to religion? But of course that is pure ego-centric thinking, seeing cause and effect through the very narrow lens of my remedial maths class. As it turned out no teacher showed up to funnel equations into our brains at the next class. We waited, and waited, and began to realize that the school had overlooked our small class of arithmetical disasters. We made a pact to keep quiet and not draw attention to ourselves; when it was time for our class we discreetly disappeared to an empty music room and read magazines or did homework. The shocking thing is that we did this for over a year! By the time we took our final exams the school must have realized the oversight but also opted to say nothing! So, when I read that Tegmark suggests that we live in a mathematical universe I feel a little nervous. I prefer to think of it this way: the universe is really nothing more than an imagined object and every imagined object is in a sense its own universe. That works don’t you think? Perhaps I am a doppelgänger that got lost? I am simply applying the laws of the wrong universe to my sums! Easy to do and completely understandable. 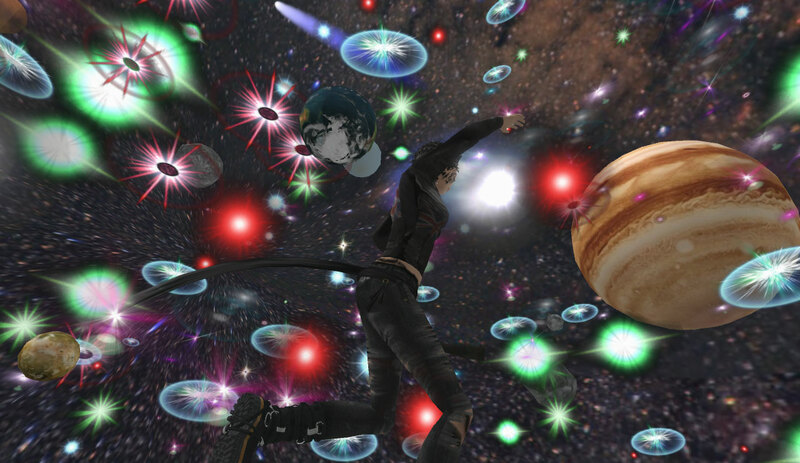 Now, is Second Life a doppelgänger multiverse? After all, if we can have parallel universes and parallel selves, then perhaps we can have parallel Second Lives too? Maybe I am more real in Second Life because I am generated by zeros and ones? Maybe my avatar is more real than me? Maybe it is good at maths? How we think about ourselves effects how we interact with the world around us. We can easily accept that there is a link between how we feel and how we behave. Now, for those of us opting to enter virtual worlds, there is a new dimension of self-perception available for exploration, our avatar. How do we perceive ourselves when we use an avatar? Our symbolic self-representation can carry out actions, and conversations, whilst being simultaneously observed by ourselves. We do not see a mirror reflection of our physical self we see instead an idea of ourselves. This visual idea of self is strangely powerful even though we do not quite understand it. What we see, and how it makes us feel, is of huge interest to bloggers and researchers alike. Connected Health also links to a Boston.com report on neurologist, Dr. Daniel Hoch who is researching the effects of teaching the Relaxation Response in Second Life. As he observes, ”There are an awful lot of people creating their own meditation spaces”. This is true! There are many, many virtual cushions with meditation scripts embedded in them waiting to trip up un-mindful avis! All these cushions point to people seeking inner peace, even if only on the level of watching their avatar help land aircraft while seated in the lotus position. These studies examine how our avatar’s appearance and actions affect us later when we are ‘off-line’. It is intriguing to read in the Time magazine article that people who observed their ‘look-a-like’ avatars exercising on tread mills in Second Life, were more likely to exercise later in their physical life compared to those who just observed their avatars lounging around. Thunder-breath. Green and blue Pelagic Sea Dragon by Flea Bussy. Blogs are like lumps of damp malleable clay. We bloggers bend and shape our blogs into little idea carrying vessels, then we display our wares out on the Internet. The Internet is more like a giant car boot sale where people can wander about aimlessly picking up shiny, eye catching objects here and there. This blog is a simple thumb pot (with pictures on its sides), there are cleverer, more highly glazed pots (some could even be termed fine bone china vases) to see out there. Green and blue Pelagic Sea Dragon by Flea Bussy (underwater view). I like to get one idea into my blog and then put it out to be read by the web wanderers. These unfocused ramblers flitting here and there, according to their passing whims, have extraordinary influence. 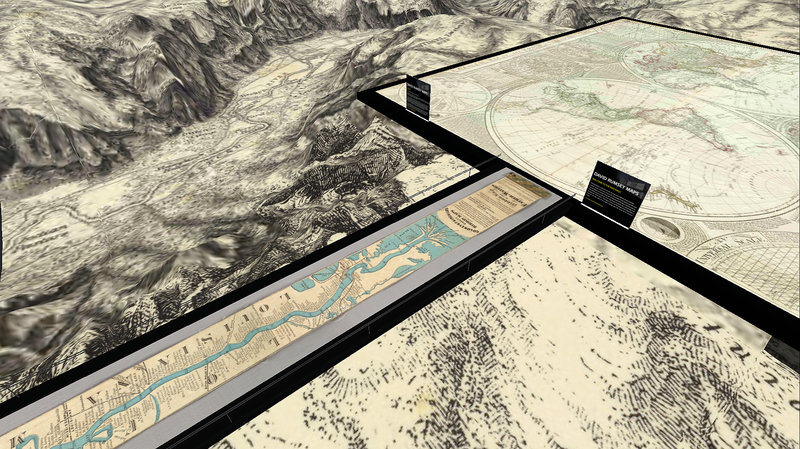 Their gathered searches, funneled by search engines, become geo-systems moulding the shape of the World Wide Web itself. (A chicken or the egg situation, which came first, the searchers or services?) 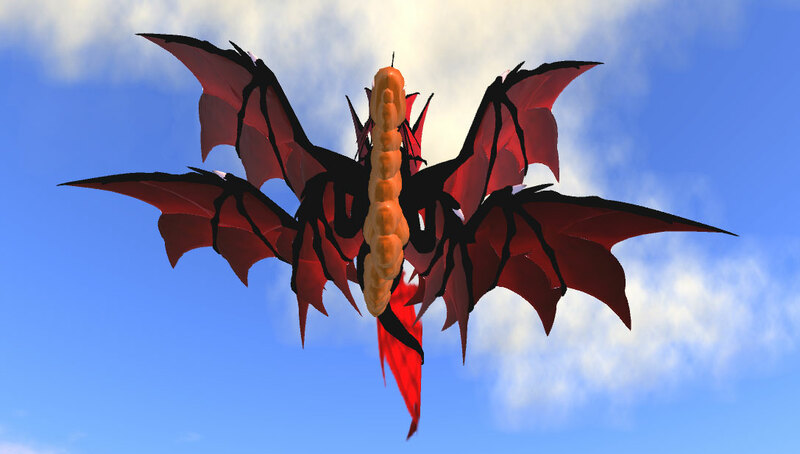 Google Images for instance funnel hordes of dragon-seekers to this blog. 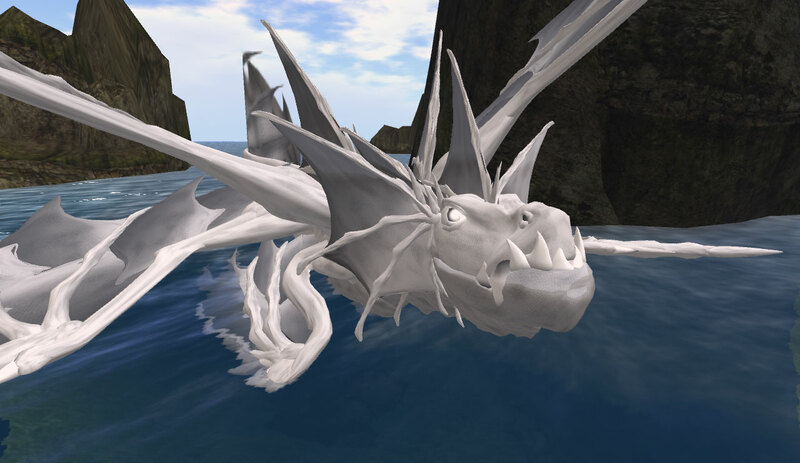 Never mind my stunning pearls of insight, my thought provoking reveries into Social Presence Theory or the nature of virtual worlds, my blog visitors are hungry for dragons. Orange Pelagic Sea Dragon by Flea Bussy doing a loop-the-loop. Lurking amongst the rocks. White Pelagic Sea Dragon by Flea Bussy. Red Pelagic Sea Dragon by Flea Bussy flying over dormant volcano. 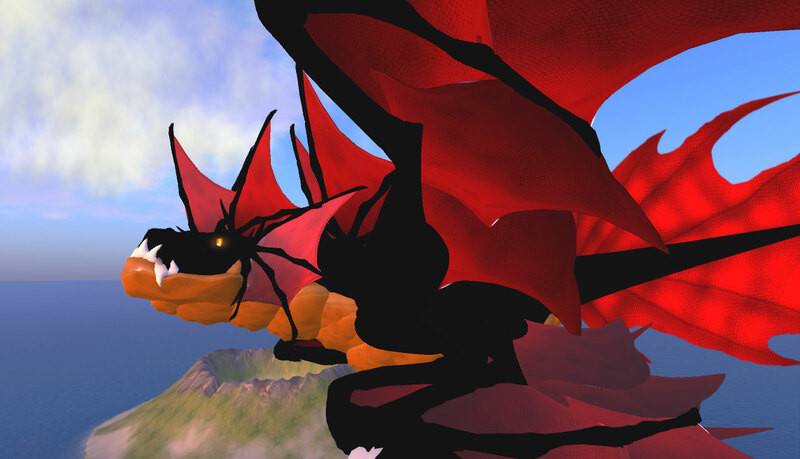 Dragon flying overhead. Red Pelagic Sea Dragon by Flea Bussy. Now I am starting to wonder if this blog should be re-named ‘Thunder-breath’? I will have to think about that, but then, ‘thumb-pot’ has a certain something. 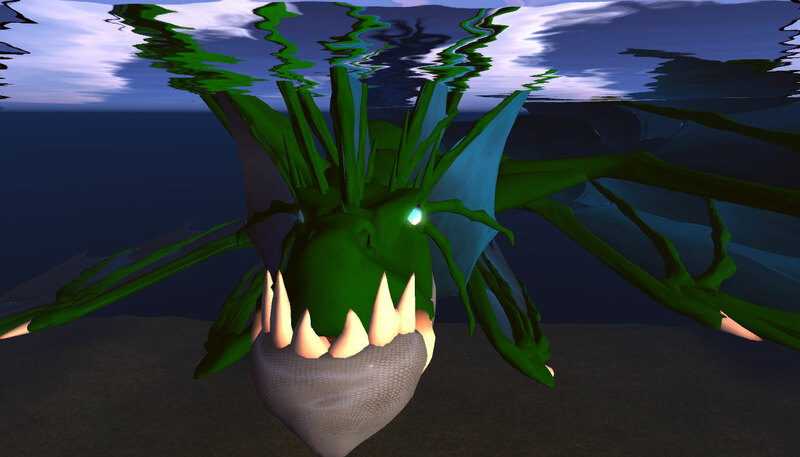 To see more of Flea Bussy’s avatars visit Grendel’s Children in Second Life™. 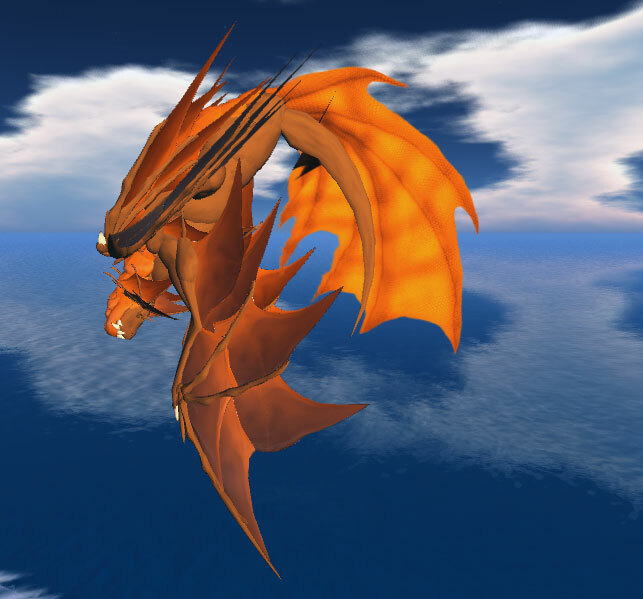 Cyberloom’s most popular post of all time: ‘My Dragon Avatar!’ featuring the metal dragon avatar created by Malathar Xavier.